On Good Friday and Easter Saturday (April 19 and 20) the Easter Bunny will be making a visit to the Market Hall, in Claremont Street, to run an Easter rabbit and egg trail. Youngsters, who find all the bunnies and eggs on the trail, will be rewarded with an Easter treat. There will be kitchen gadget demonstrations in the market over the weekend too. Everything needed to celebrate an artisan Easter can be found in the market, from locally-sourced fresh produce and lamb to lovely Easter decorations for the home, fresh flowers and artist-designed Easter cards. The venue has become a go-to destination to find raved about street food venues, artisan producers, specialist food and drink and unique independent retailers, ranging from on-trend home interior and gift stalls to vintage, arts and crafts and a range of other specialists. All the food one could need to fill the home larder can be found – from quality meat, game and fish, organic fruit and veg and local eggs to artisan cheeses, cured meats, bread, a vast selection of wholefoods, grains and oils, specialist teas and coffee and even handmade gourmet spice blends and organic wines made by small producers. 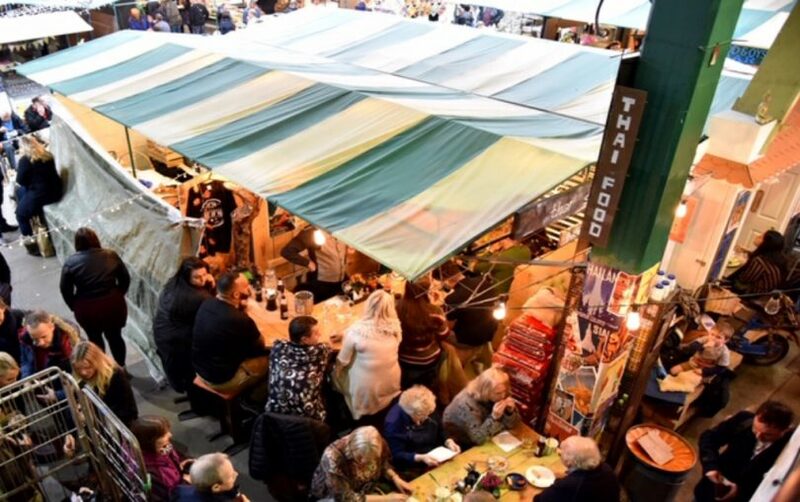 The market enjoys the reputation of being one of the best lunch venues in Shropshire and you can find something delicious to eat from almost every continent of the world. Diners can enjoy Beijing dumplings in a Chinese teahouse, champagne and oysters at a continental-style seafood bar, Spanish tapas, Thai or Indian street food, South American and South East Asian dishes as well as tasty vegan eat-in or take-away lunches. Most of these eateries regularly open for the market’s Saturday late nights which attract up to 1,700 people through the course of an evening. Late night dates for the rest of 2019 are scheduled for May 4, July 6, September 7, November 2 and December 7. Find out more by visiting The Shrewsbury Market Hall website.